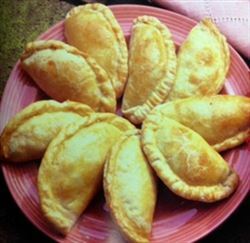 To prepare delicious empanadas, combine flour, salt and baking powder and sift together thoroughly. Let stand for about ten minutes. On a lightly floured wooden cutting board, roll dough until thin. Using a jar top, cut dough into eight circles, about four inches in diameter. Enjoy this delicious empanadas Mexican recipe! like a pie crust, it has no eggs. this is an easy and great recipe for empanadas, i do use a larger cutter (6") though. I'm just curious, making them tomorrow. No eggs in the dough? making them tomorrow. No eggs in the dough? Merchant Response:Sorry, I guess the recipe from Ann Hazard does not use egg, but I can tell you that it makes sense to add an egg as well. I hope it works for you. Make great Empanadas!